A sweet, juicy and delicious soft fruit, our range of Blueberries are naturally rich in vitamins and antioxidants, with our current varieties being available to order online in 3L containers. 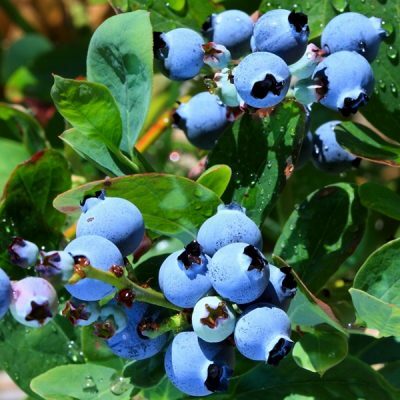 Blueberry plants are easy to care for and generally easy to grow. Currently, we have popular varieties such as Pink Lemonade, Brigitta, Darrow, Blue Crop and Gold Traube available at various times of the year. To get the most from your Blueberry plants, they should be grown in acidic soil, or if growing in large containers, you should use an iron-rich compost such as Ericaceous. 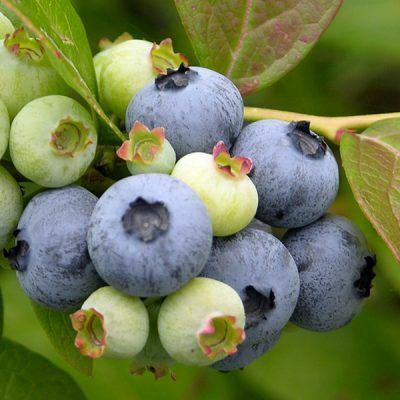 This hardy soft fruit is easy to grow and can produce huge crops of tasty blue berries, ideal for a large number of uses. 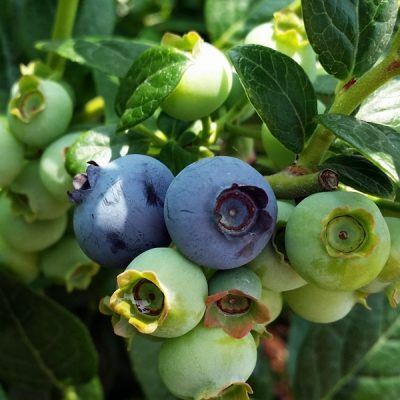 One key factor to consider when growing your own blueberry plants is that we recommend growing 2 varieties close together, this allows the plant to grow larger fruit through cross-pollination. 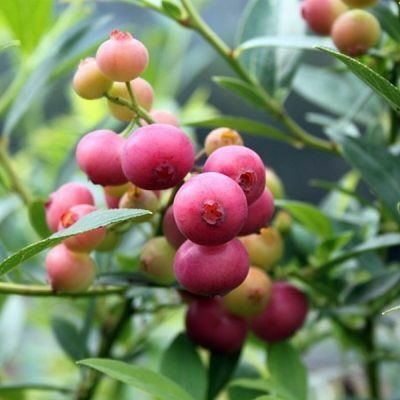 Adding to the appeal of the Blueberries are the flowers which they produce, with some varieties have large white flowers in Spring, and fiery foliage in the Autumn. Like many berries & soft fruits, Blueberries are known as a ‘superfruit’ and can provide all types of health boosts. Packed with anti-oxidants & Vitamin C, they are known to decrease signs of ageing, guard against cystitis, bladder infections & lower cholesterol. Plant in an open sunny spot sheltered from strong winds. If they are to thrive, blueberries require light, free-draining acidic soils, with plenty of rich, organic matter. The soil should have a lower pH of between 4 and 5.5, similar to the requirements of rhododendrons and camellias. It’s possible to lower the pH levels of your soil with sulphur chips or dust. However, they’ll need to be added three weeks before planting to take effect. If the soil is not well draining, each planting hole should be prepared by filling it with a mixture of soil and coarse grit. Monitor the soil’s pH every few years, because it may be necessary to add acid. Remember, if your soil is not acidic, blueberries will be just as happy planted in a pot with ericaceous compost. The pot size should be approx 1.5 times the size of the root ball to ensure plenty of room for rooting. 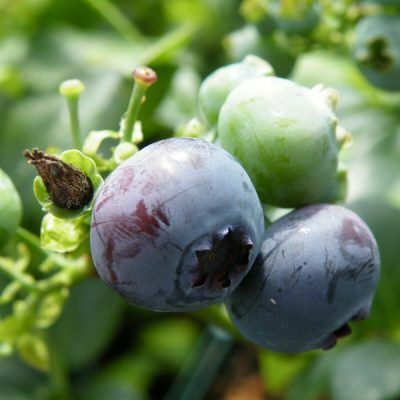 It is a good idea to plant two different varieties of blueberries to ensure cross-pollination although two of the same variety is just as acceptable. 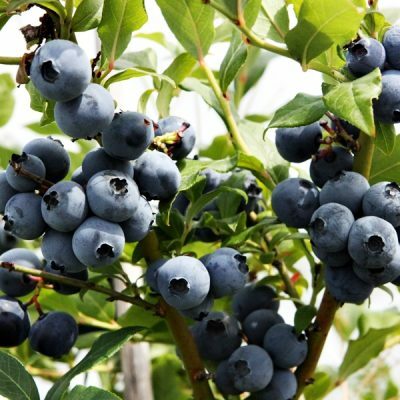 A single blueberry plant will produce fruit, but the yields will be higher and the fruits bigger if more than one plant is grown. They require a position in full sun or light shade. 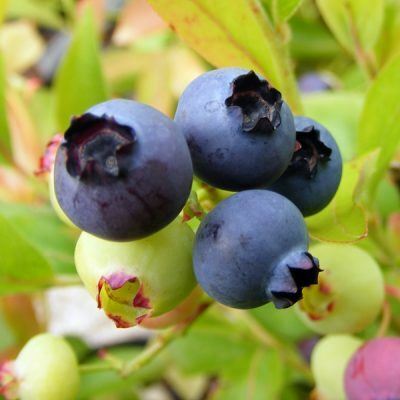 Plant blueberries in autumn or winter leaving about 1.5m (5ft) gaps between them and mulch with a layer of acidic peat, wood chippings or pine needles. Water in well, using rainwater rather than tap water if possible. Tap water contains lime which renders the soil less acidic over time. Use nets to protect plants from birds in the fruiting season. In spring, apply a little Bone Meal around each plant. Once this is done, apply a mulch such as chipped up pine tree or pine needles. These are ideal mulches to place around the plants because they’re fairly acidic. Ensure that all weeds are removed & that the soil is moist before mulching. Mulching helps to keep the soil cool & moist as well as keep down the weeds. Water plants regularly. They require water from when their buds begin to show in spring until their leaves fall in autumn. Again, remember to use rainwater. For plants grown in pots, give the plants a high potash feed (such as tomato feed) occasionally during the growing season. 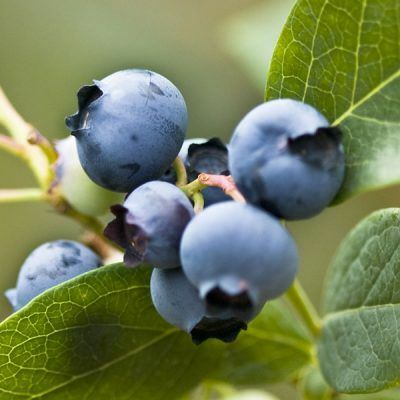 Blueberries produce fruit on branches that were produced the previous year. For the first two or three years of a blueberry’s life it’s not necessary to prune it much, apart from keeping the plant tidy. After this, blueberries need regular pruning to maintain plant vigour and high quality berry production. dormant. When pruning, take out any dead, dying and diseased wood. Locate the oldest canes and remove one or two at the base each year. Remove the old canes that don’t produce much fruit to make way for younger, more productive canes. Prune out low branches that will lie on the ground when laden with fruit and remove all twiggy wood on the ends of fruiting laterals.